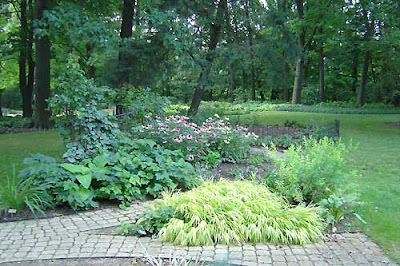 Here are some of the promised photos of Innis Gardens in the Metro Parks system of Columbus Ohio. It is one of our family’s favorite places to visit, even the teenagers like it. 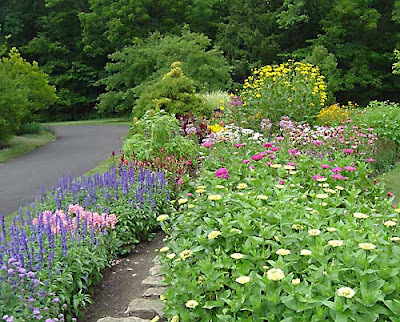 Once a private gardened place of two elderly sisters, it was given to the Metro Parks system and has been developed diligently over the years. This makes it a top notch public garden with many ares of interest. One of the things I most like about it is the very human size, which means you can have as short or long a visit, with plenty of places to sit according to your desired time and energy. 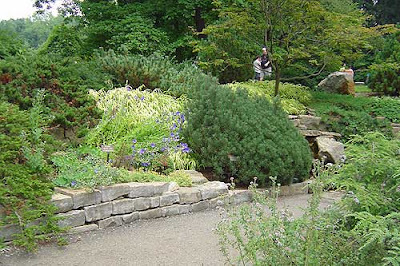 One of the features of this garden is the sunken and sloping rock garden area, it has a running stream and two small wishing pools, terraced with rock walls it holds many rock garden and unusual plantings. This flower border in the third photo can be viewed from the herb garden and is situated along the main entry path. It was in full bloom and visited with prolific numbers of butterflies. This entry garden near the parking lot is apart from the main area of gardens. 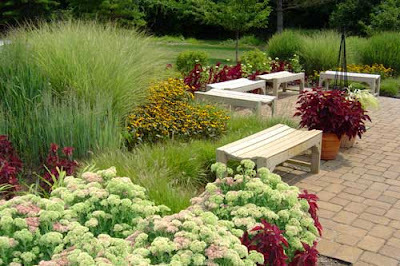 Done in the New American style with grasses as a feature I think it is particularly successful.